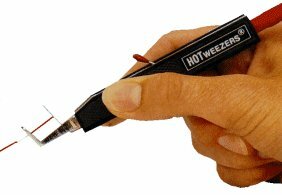 HOTweezers® represents the state of the art in design and construction of thermal wire strippers. The hand unit is shaped like a pair of cutoff tweezers and weighs less than 2 ounces (57g) including cable and connector. Beacause of this, the HOTweezers® Thermal Wire Stripper fits comfortably in the users hand, and the wire stripping operation is smooth and natural. The small size and light weight have proved in production use to be very effective in increasing output and reducing operator fatigue. The most unique feature of the HOTweezers® Wire Stripper is that the heater filaments are completely sealed in the stripping head. The head is fabricated from a high-strength, high-temperature alloy with very good oxidation and wear properties. Hermetic sealing of the filaments in a high-temperature alloy offers several advantages. 1. The filament is resistant to oxidation. 2. The stripping head will not disort nor lose alignment as is the case with ordinary hot wire strippers. 3. Since the filaments are enclosed, a greater portion of the heat generated is retained to do useful work. Consequently the power supply can be much smaller than usual and the current consumption is drastically reduced. The M-10 power supply consumes a mere 20 watts at the highest temperature setting. 4. Wire holes can be ground into the stripping head without damage to the filaments. With wire holes, the rotation of the stripper required to accomplish a strip is reduced from 180º to 15º and mashing of conductors, especially the finer gauges, is completely eliminated. 5. Because the filaments are an integral part of the stripper body, no maintenance is required. 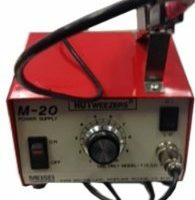 With the M-20 Power Supply, the tip temperature can be adjusted from 300ºF (149ºC) to 1450ºF (788ºC). Other thermal strippers offer this feature but there's a difference. The mass at the stripping tip of the HOTweezers® is much greater than ordinary hot wire types and is more resistant to cool down when the stripper contacts the work. Becuase of this, the tip temperature can be maintained at a level very near the softening point of the insulation material but below its charring or ignition temperature. Virtually any organic insulation can be stripped without burn marks. It is now possible to thermal strip low-temperature materials like PVC, Nylon and Polyethylene without the insulation slugs sticking to the stripper or the conductor. The HOTweezers® will easily handle high-temperature insulations sure as PTFE Tefzel*, Teflon* and Silicone Rubber without the charring. Three different models of the HOTweezers® Wire Stripper are available to satisfy most wire stripping requirements. For precise insulation removal models 7A and 7B have stripping holes to yield a clean, even strip free of insulation "tails" and to prevent mashing of the conductor strands. Model 7C is designed for use on cable jackets and larger diameter conductors. Maximum cale or conductor O.D that can be stripped is 0.25 inch (6.35mm) and maximum insulation wall thickness is 0.05 inch (1.27mm). For stripping requirements that exceed these dimensions the HOTnife can be used. 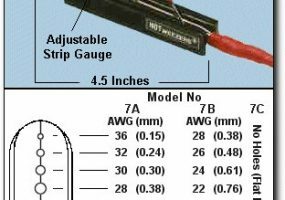 All models have the new strip length gauge so that repetitive wire stripping operations can be done accurately. The gauge is easy to adjust without a screwdriver or special tools. The standard power cord for all three models is a flexible, lightweight cable with a high temperature silicone rubber jacket that resists burns. If you have a requirement that may require a special model, please contact us directly. Stripping TEX-E Wire - It is recommended that you use the 7A Hand piece with the setting on Hi - on about 4 - Trial and error will prove the best way for operators to achieve the desired strip - it is also considered better but more time consuming to strip back as shown and then cut the end off - this prevents a build up of the plastic on the stripping blades and otherwise constant cleaning. HOTweezers® and any thermal wire strippers should always be used with suitable fume extraction depending on the type of material being stripped. The Model 3A Anti Static HOTnife® Thermal Wire Stripper is designed for use in applications where the use of the razor blade from a knife is hazardous to personnel and components. Heating occurs in the blade, not in a remote capsule and the blade with its bull edge will not cut when cold. The HOTnife® Wire Stripper is useful in deporting, deflashing and other applications where a heated blade can simplify a manufacturing operation and increase yields. Due to its small size, it is highly maneuverable and can be easily used under a microscope for delicate work. Because of the single blade construction, it can easily strip large diameter conductors and jackets including irregular shaped cross sections without nicking sheild or conductor strands. 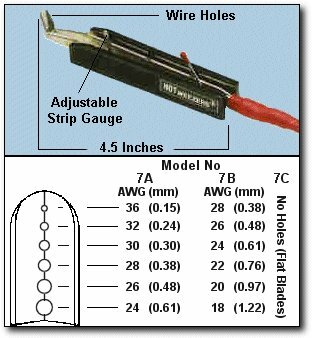 The 3A Anti Static HOTnife® Thermal Stripper is used with the M-20 Power Supply and has a useable temperature range from 300ºF (149ºC) to 1550ºF (843ºC). 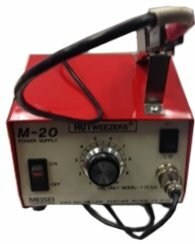 The Anti Static HOTweezers® and HOTnife® are used with the compact M-20 Power Supply, which features an on-off switch, "Hi" and "Lo" switch, a temperature control and a unique holder for the hand unit. Placing the HOTweezers® or HOTnife® Thermal Stripper in the holder activates a switch that sets the temperature control to an idle mode. When the wire stripper is removed from the holder, the control is switched back to the original setting. The supply provides an isolated, low-voltage output for operator safety and is rewired to full UK wiring specification and CE marked. Size: 3" x 4.5" x 4.5"